Do we think it's all over? It’s probably best not to be too fatalistic. But Scotland make it hard. And 0-0 with a limited Lithuania side is a massive blow to our already slim chance of reaching Euro 2012. I actually felt there were some positives, especially in the first half. It was certainly a much improved performance from the Sweden game a few weeks ago. But even in that first period the chances were few and far been. Barry Robson was charged with control of the set pieces. And, given Lithuania’s apparent fear of Scotland hitherto little know attacking reputation, he was given plenty of opportunity. He rarely delivered. When a free kick did afford Stephen McManus a glimpse of chance it was Darren Fletcher who delivered it. Why either manager or players didn’t relieve Robson of his duties at that point we will never know. There was, as ever, the gnawing fear that our failure to get a goal in the first half would be an issue in the second half. So it proved as the game wore on and Scotland increasingly lost their shape and composure. Kenny Miller, who put in his normal willing shift without really threatening, looked ever more isolated. Again we might have expected more from our midfielders. Fletcher’s struggles to impose himself within the restraints of the Scotland team continue, Scott Brown was anonymous except when being drawn into foolish niggles. The recalled Steven Naismith had a couple of half chances but displayed a hesitancy that a team creating so little can ill afford. Given Scotland’s dominance of the first half there is a strong argument that Craig Levein should have made a change or two sooner. The defence looked sound enough and both Alan Hutton and Steven Whittaker were able to get forward as the manager must have planned they would. Comfortable but not ahead there should have been a willingness to get somebody - Boyd, Dorrans or McFadden - on earlier. It might have meant a change to the shape of the midfield but a team enjoying possession like Scotland did in the first half shouldn’t be scared to take a calculated risk in the search for a goal. That, though, might not be the Levein way. Still, it would have been nice to have at least tried. That the final substitution was Whittaker coming off for Christophe Berra in the dying moments as Lithuania suddenly looked to offer a threat of their own was a perfect summary of a big opportunity lost. The manager was left to bemoan the lack of protection offered by the referee. In fact Cuneyt Cakir had a reasonable game. He punished Lithuania for their niggly start to the game and wasn’t scared to show his intent with yellow cards in the opening stages. The truth is Scotland squandered the free kicks they were awarded. Our fault, not the referees. Players like Brown, Fletcher, Robson or Hutton shouldn’t be trying to hide behind the referee on nights like this. 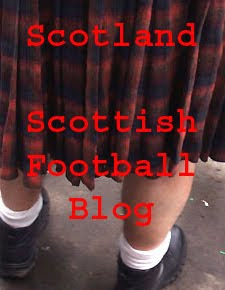 I wrote before the game that I expected Levein to bring organisation and spirit to the Scotland team. They were certainly more organised tonight. But they lacked the spark that they needed to take advantage of the situation they found themselves in. There is little doubt that this is two points dropped. Given the opportunity to provide a statement of intent Scotland failed. It is difficult to see either Spain or the Czech Republic being so profligate on their trips to Kaunas. One match played. And Euro 2012 has never looked so far away.